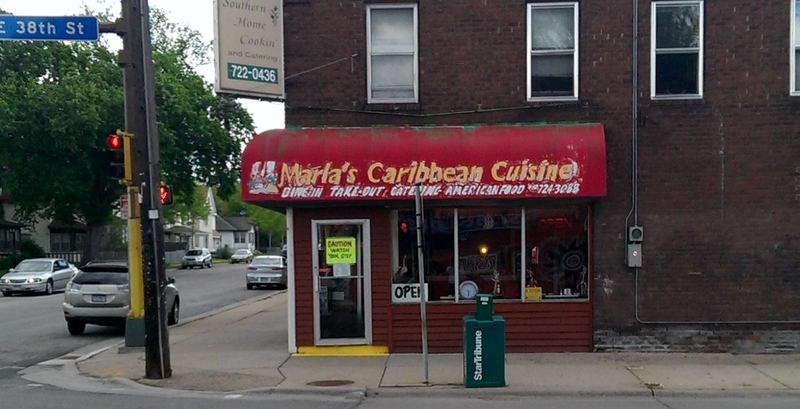 Marla’s Caribbean Cuisine used to be the former Jamaica Jamaica restaurant until owners Marla and her husband Ian bought it out and renamed it Marla’s Caribbean Cuisine. After taking care of others as a nurse for 18 years, she is now working in her restaurant full time. 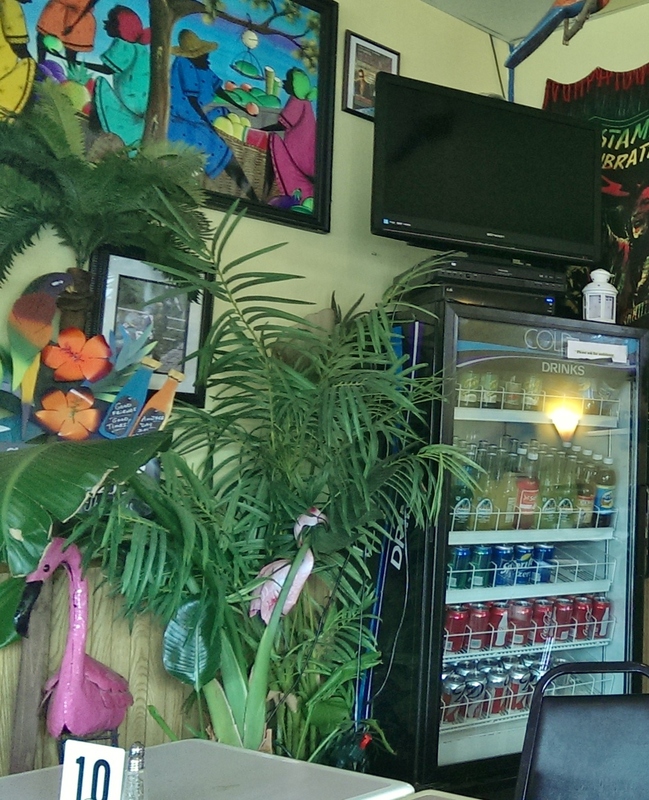 According to her website, Marla has “reached Nirvana.” For their customers craving Creole, Indian, and Latin flavors, Nirvana can be found here. Both she and her husband have roots from Trinidad and Tobago, which means more authentic entrees for us Northerners! It’s no surprise that Marla and Ian’s delightfully spiced entrees have gained solid recognition among the foodie culture in Minneapolis. This became especially apparent when Marla’s was featured on the Food Network’s “Diners, Drive-ins and Dives” with Guy Fieri. Check out the video below. Let me just take a moment to highlight their decorations. 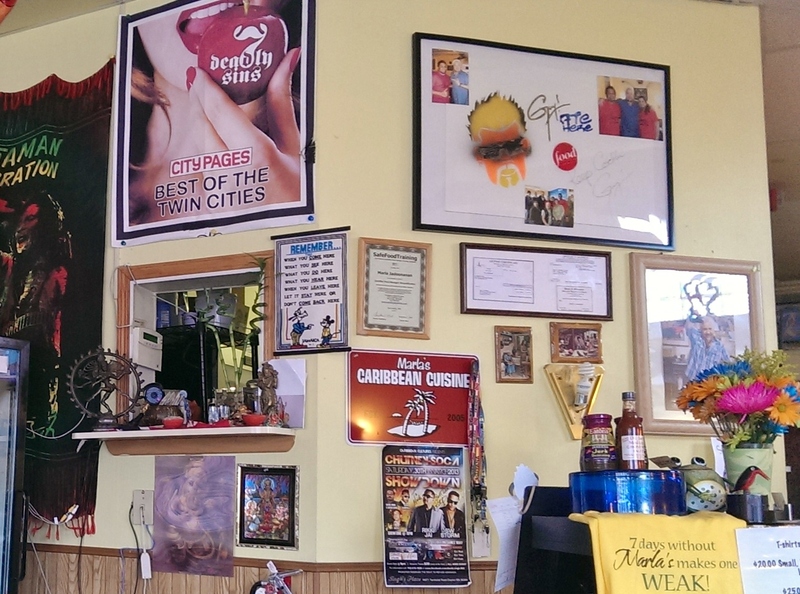 The walls of Marla’s are plastered with fun posters with a distinctly reggae flare. This makes perfect sense given that this is supposed to be a Caribbean inspired restaurant. Can you spot Guy Fieri? My fiance and I had a blast looking around at all the posters and decorations. Okay, to kick things off we had to get an order of fried plantains. For those of you who haven’t had these babies before, please, order them the next chance you get! If you’d rather stay in, these are extremely easy to make as well. All you have to do is go to the grocery store and buy plantains. Then you need to heat oil in a pan until it’s good and hot. 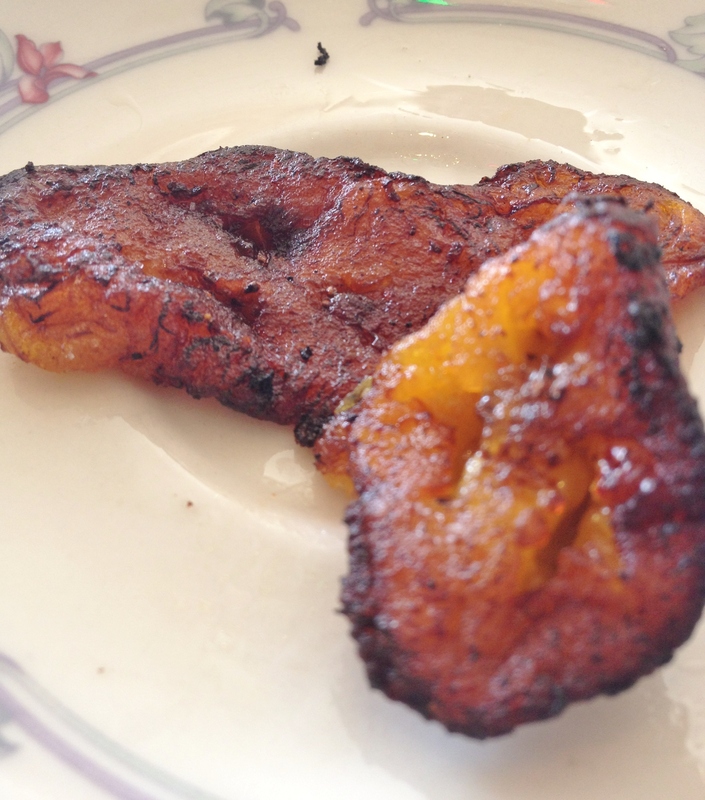 Now, you can choose to slice the plantains and fry them or you can fry them whole if they are smaller. Either way, just stick them into the pan of hot oil and wait until they are brown on the outside and even have a slight crisp. You can eat them with either sea salt or a little bit of sugar and cinnamon. Long story short, we order these every time … seriously, every time. Just get them. One of the best features of Marlas is that you know are getting a fresh, home cooked meal. Literally, they make everything to order and not a minute before. It’s like going home and having mom and dad cook you amazing Caribbean food! For my main meal of the night, I went with Channa and Potato Roti, which was featured on the Food Network. 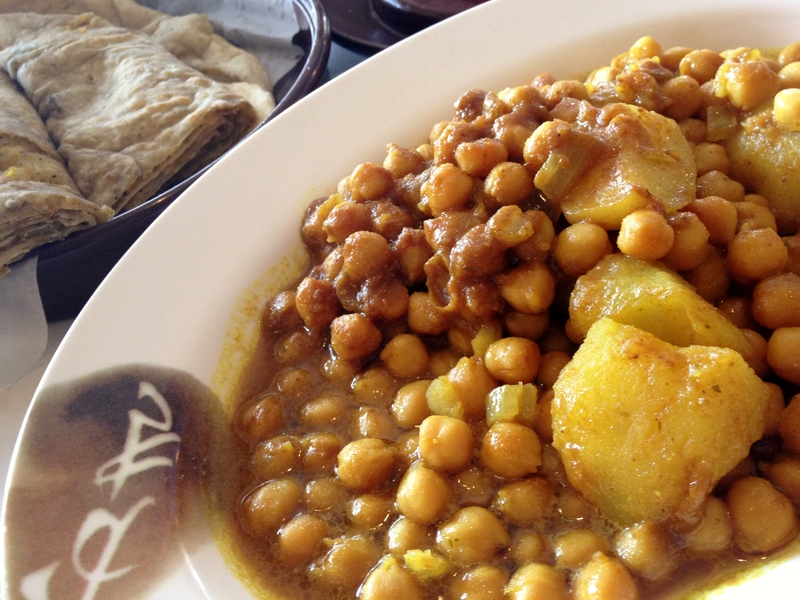 What you get is a whole lot of chick peas, golf ball-sized potatoes and onions all seasoned with curry. 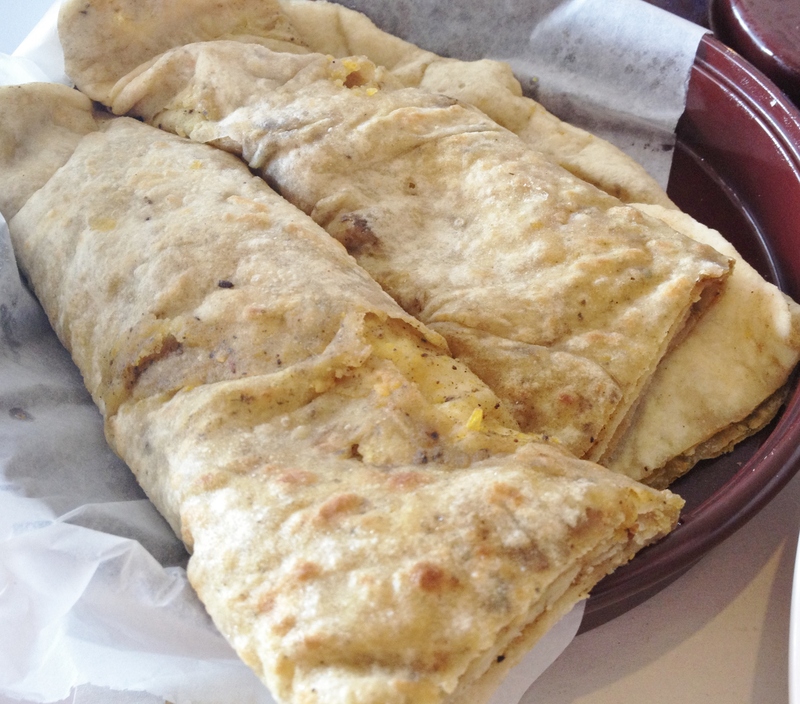 Served is a soft, flakey and warm roti. I highly recommend this one, but be sure you read their menu for their spicy levels. Medium is very hot and Indian hot is just ridiculous for someone not used to it! Tony went with the Caribbean jerk. When we were here a couple months ago, a friend of our ordered this and Tony was determined to order it the next time we went. He got his wish and was definitely pleased. I can see why. The slight char on the chicken really gives it a smokey flavor that is only enhanced by the spices the meat absorbs while cooking with the peppers and onions. The jerk is served with white rice. Beware, this dish is HOT! Thank you Food Network for finding this place. 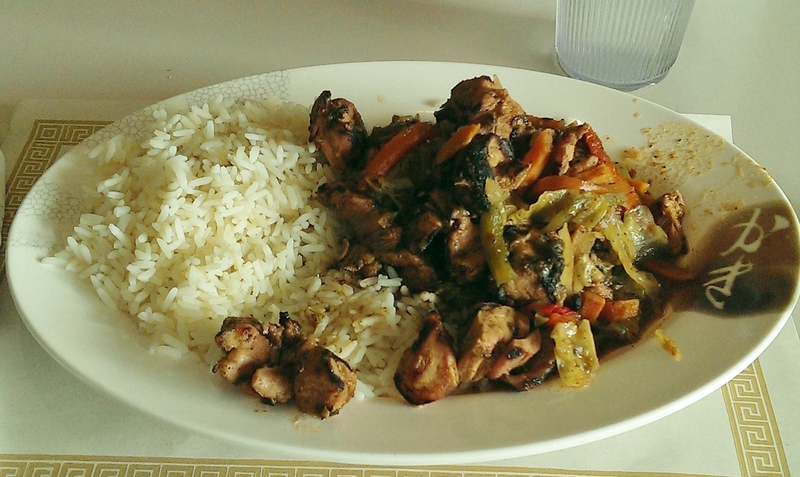 Tony and I continuously enjoy coming to Marla’s Caribbean Cafe to spice up our dinners in the week. You can always expect a great, friendly staff and food that is both filling and unique. Two things are certain, we’re positive that we are going back soon and we’ll be starting our meal with an order of plantains. We hope you enjoy Marla’s as much as we did!